Maxxum® series tractors deliver the versatility and productivity your operation demands — from fieldwork to loader work. A Hardworking, Versatile Machine That You Can Rely On. Case IH Maxxum® series tractors combine efficient power with operator convenience. Powered by FPT engines, these multipurpose workhorse tractors deliver increased productivity, performance and fuel efficiency to keep your operation running smoothly. Versatile workhorse with the proven 16x16 semi-powershift transmission. New ActiveDrive 8 dual-clutch transmission delivers a wider range of working speeds without torque interruptions. An optional advanced loader joystick allows you to shift gears from the loader joystick. Outstanding choice for long, demanding days in the field, whether planting, baling hay or doing chores around the farmstead. Simple-to-operate CVXDrive continuously variable transmission delivers seamless speed changes while maintaining power to the ground. Automatically and continuously finds the most efficient gear ratio and engine speed. Whether you prefer a top-of-the-line, superior operator environment or the basic comforts, Maxxum series tractors let you customize your experience to the level that meets your individual needs. Operator’s Platform: A large operator’s platform and fully opening and functional left and right cab doors provide easy access and exit and gives you plenty of legroom, storage space and room to maneuver. The single-piece, molded floor features an easy-to-clean covering that helps reduce noise and vibration. Active Comfort Seat Package: A full day’s work moves along quicker and more efficiently when you’re comfortable. The Active Comfort Seat Package seat holds you in a neutral position, even on rough terrain, for the most comfortable ride possible. Or choose from three other deluxe or standard seat options, each designed for maximum comfort. Adjustable Steering Column: The tilting and telescopic steering column is fully adjustable to any size operator. Or change it up throughout the day to stay comfortable. For a more comfortable feel, choose the optional leather-wrapped steering wheel — similar to the one available on Magnum and Steiger tractors. Adaptive Steering Control: Make steering easy for any operator. Variable ratio steering allows operators to customize the number of steering wheel rotations from lock to lock, which reduces operator fatigue in repetitive tasks and during transportation. MultiControl Armrest: All Maxxum MultiController ActiveDrive 8 and Maxxum CVXDrive models feature the innovative functionality and easy operation of the MultiControl Armrest. The MultiFunction Handle places 85 to 90 percent of the controls you use most in one hand so you can stay focused on your work, while reducing stress and fatigue. In-cab Storage Compartments: Ample storage space helps keep the Maxxum cab organized. And we’ve thought of everything, including a front storage box that’s semi-refrigerated on MultiController and CVXDrive models. Foot and Hand Throttle: Every Maxxum tractor includes standard foot and hand throttles, so you can choose the option that best suits your preferences or the task. Instructor’s Seat: The flexible instructor’s seat provides space when training new operators. Or fold it down for a flat work surface. Advanced Loader Joystick: Now you can shift gears and control speed without removing your hand from the joystick. This optional feature reduces loader cycling times, helping you be more efficient. Wide-open Views: With more than 63 square feet of glass area, the Maxxum SurroundVision cab provides unobstructed vision in all directions, including overhead via a high-visibility roof panel. Up front, the cab’s roofline extends beyond the glass to provide shade from the sun. Tinted rear-glass on all models with suspended cabs helps reduce glare. Forward Looking: The narrow, sloping hood on Maxxum series tractors provides clear, unobstructed forward sightlines to the front wheels, loader and other mid- and front-mount attachments. Instrumentation: Control placement, along with dashboard and A-pillar instrumentation (depending on configuration), provide access without inhibiting visibility. Suspension: The optional cab suspension package offers superior comfort on the road and in the field by reducing shock loads transmitted to the tractor by 25 percent. Pair cab suspension with the suspended MFD front axle option for a best-in-class ride that will help you stay fresh and comfortable through the longest days. Climate Control: A comfort-creating manual or automatic HVAC system lets you personalize your workspace. The rear window opens for fresh air circulation. Radio Options: Take advantage of our quiet Maxxum cabs and catch the latest market report or relax to your favorite tunes. An optional Bluetooth® radio lets you bring your own entertainment with you. A built-in radio antenna amplifier helps you stay connected even in the most remote areas. The way implements attach, function and power up is just as important as a tractor’s engine, transmission and cab comforts. 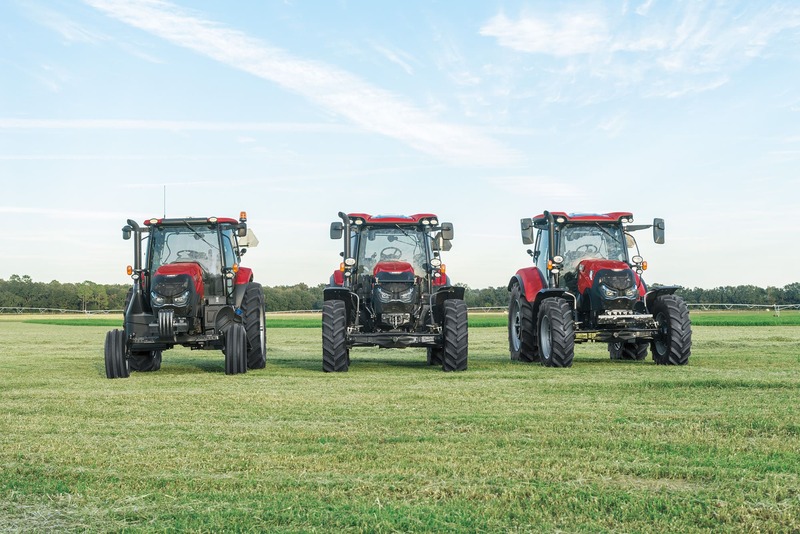 Maxxum tractors feature the power and capacity that make it a hardworking versatile machine, plus ease of use that makes for efficient productivity. Front-mount PTO and 3-point hitch options allow maximum flexibility and versatility for special applications. Support every option with rear- and mid-mount hydraulic valves. The standard rear 540 and 1,000 rpm and optional front 1,000 rpm PTO give you the flexibility to power all types of implements and attachments. Pressure-flow Compensation: Pressure-flow compensating hydraulics are standard on Maxxum MultiController ActiveDrive 8 and CVXDrive models and provide the precise planting vegetable growers demand. Maxxum models feature an open-center system. Remotes: Further customize your Maxxum tractor by matching the hydraulic remote configuration for the implements and attachments you plan to power. Choose from two to four remotes with adjustable detents. Fully color-coded remotes and in-cab controls simplify hook up. Loader Lift Capacity:Maxxum tractors paired with the recommended Case IH L755 loader: 4,872 pounds to maximum height at pivot pins. 3-point: Standard telescoping stabilizers and available quick-attach claw ends or telescopic lower links with ball-link ends make attaching and hooking up implements fast and easy. Two turnbuckles provide side-to-side leveling of attachments. Lift capacities: Mechanical position control and adjustable drop rate make operation easy and precise. 1Lift capacities as reported by Nebraska Tractor Test Laboratory. Swinging Drawbar: A swinging drawbar lets you customize hitched implements to your desired position or move the drawbar to keep it out of the way when not in use. All Maxxum ActiveDrive 4, Maxxum MultiController ActiveDrive 8 or Maxxum CVXDrive models feature heavy-duty front-axle options. Maxxum ActiveDrive 4 models also feature a 2WD option. When a 2WD tractor is best-suited to your needs, Maxxum 2WD models deliver all of the power, comfort and features of the Maxxum line at a lower price point. Enhanced maneuverability and a tighter turn radius, plus efficient power to the PTO and hydraulics, help make 2WD non-suspended, standard-duty front axle an excellent option for hay and forage operations, dairy farms, vegetable production, municipalities and small-acreage mixed farms. Multiple front-axle systems — suspended or non-suspended, and with or without brakes — allow you to customize your Maxxum tractor to your operation. New for Model Year 2018 Maxxum tractors is a Class 4 heavy-duty MFD front axle system. It’s the toughest axle ever offered in a Maxxum series tractor so you have improved traction and increased power to the ground for even the most demanding applications, such as loader work and mounted front tanks. Available on the Maxxum MultiContoller ActiveDrive 8 and Maxxum CVXDrive models, factory-available dual wheels deliver better flotation, traction and stability for planting and loader work in challenging conditions, such as hills and wet conditions. Factory-installed AFS components and dealer-installed options on Maxxum tractors offer dependability and convenience and give you the flexibility you need to help ensure you’re ready to begin gathering data as soon as you pull into the field. Minimizing skips and overlaps saves on fuel, seed, fertilizer and chemicals. Precisely placing seeds can improve agronomic performance. Achieving year-to-year repeatable accuracy — as tight as plus or minus 1 inch — becomes reality with AFS AccuGuide autoguidance. This affordable aftermarket option is ideal for equipment that doesn’t currently have autoguidance capabilities. Within minutes of installation, ElectriSteer connects with your AFS Pro 700 display to deliver all the benefits of autoguidance. Case IH Maxxum series tractors feature easy maintenance access points and long scheduled maintenance intervals. The Case IH L755 loader meets the needs of the full line of Maxxum series MFD tractors and features fast, easy mounting and rugged, durable construction. Work with your Case IH dealer to identify additional loader options, attachments and accessories. Quick, easy mounting is a hallmark of Case IH loaders. Your Maxxum tractor arrives with all loader mounting brackets, a grill guard, mid-mount valves, in-cab joystick and hose kits. From fieldwork and chores around the family farm to the most demanding commercial farming operations, discover how the strength, versatility and durability of Maxxum series tractors can benefit your operation year-round. Value Your Hay. Handle It the Right Way. 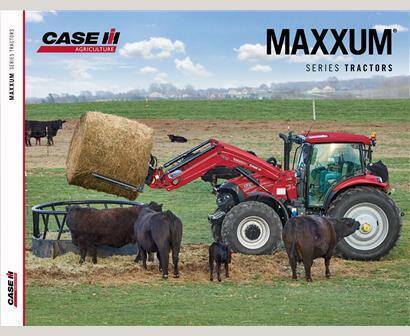 ​Configure and price your new Maxxxum Series Tractors. Customize it the way you want. ​Compare our Maxxum tractor specs to other manufacturers' specs.